James Williams, 3, of Landenberg, enjoyed his visit with Santa. His mother noted that it was a big change from last year, when the youngster cried the entire time. Santa arrived right on schedule for his visit to Penn Township’s community park on Saturday to hear the requests of all the good boys and girls. He was accompanied by one of his elves – an expert painter who offered holiday-themed face painting. 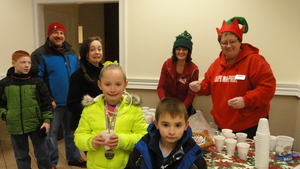 Families strolled paths lit by luminaries and with decorations courtesy of Sweet Peas of Jennersville, and viewed dozens of trees decorated by local businesses, churches and scout troops. Visitors were asked to cast their votes for their favorites, and prizes will be awarded to those receiving the most votes. Adding to the holiday spirit was a half-hour performance by the Avon Grove High School Choir, which sang Christmas carols in the pavilion. And, perfectly timed for the little ones to warm up, the events continued indoors with hot chocolate served by two elves, and two shows by perennial favorite Jungle John. He delighted the youngsters with his Christmas Magic Show. Penn’s event coordinator, Karen Versuk, was pleased with the turnout. Versuk also thanked volunteers, including Sweet Peas of Jennersville, Jennersville Giant, and West Grove Fire Company, whose members directed traffic and provided a spotlight at the park entrance.